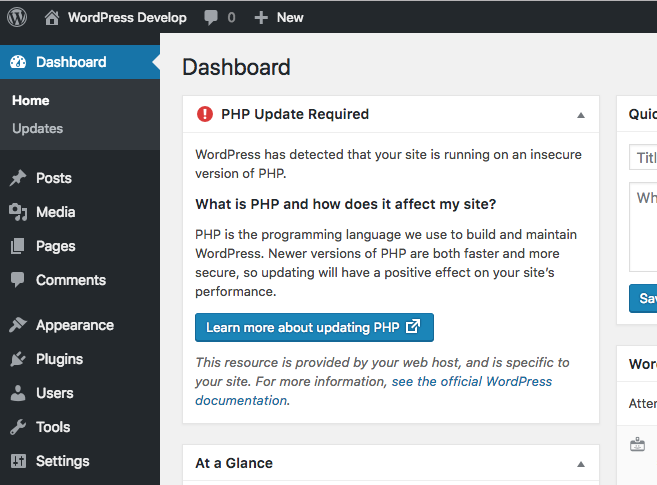 WordPress 5.1 will start showing notices to administrators of sites that run on long outdated PHP versions. It would be great in the next release to show a similar administrator notice when a site is not set up for HTTPS or the certificates are misconfigured. Do you agree with the corollary that nobody should be allowed to have a WordPress site who doesn’t want to interact with one of the organisations issuing SSL certificates? Should it be an absolute requirement of using WordPress that you have a relationship with one of those organisations? I feel like that would be really tricky to implement. You can’t do the check on the server running the PHP code, because the site could be behind a load balancer or other SSL-offload device, and the mere absence of mod_ssl (for Apache, or pick your local equivalent) doesn’t guarantee anything. And you can’t have the site try to fetch its own home page out-of-band because if you have such a device, there’s no guarantee that the back-end server actually has network connectivity sufficient to access its own sites that way. Not to say it’s not a laudable goal, but it’s one that could be a lot harder than it looks on the surface. For sites that prefer to alter this behavior or sites that would like to omit the WSOD protection altogether, it is possible to add a new drop-in file shutdown-handler.php. That file should declare a custom shutdown handler class that extends the default WP_Shutdown_Handler, and then return the instance of it to use. The default class’s functionality is split into distinct methods so that it is easy to reuse and override as granularly as necessary in a child class. Is this the expected way to disable WSOD protection? I wonder if protection should be disabled when WP_DEBUG is enabled? Right now the drop-in as you linked to is the way to disable it. I’m happy to have a discussion about making this a simpler process though. Hmm that’s an interesting point. Having WSOD protection active when developing could be an annoyance. I don’t think we could use `WP_DEBUG` here though because it’s common to have `WP_DEBUG` set to true but sending errors to a log and not displaying. Maybe use `WP_DEBUG` in combination with the `WP_DEBUG_DISPLAY` constant would be a good thing to check for. 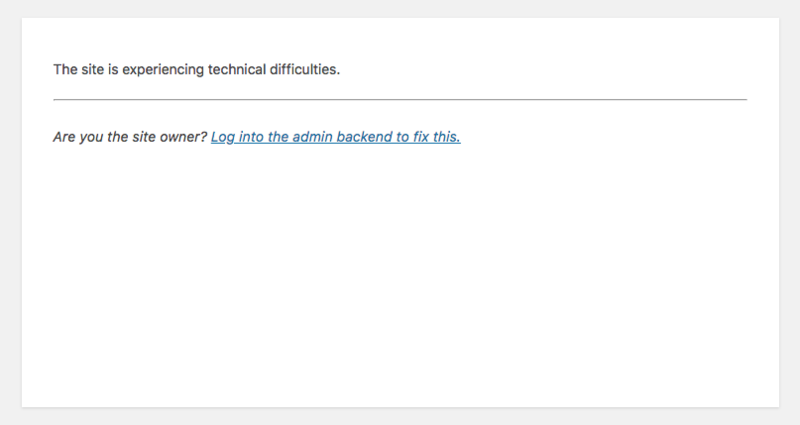 If that’s set to true then presumably the site owner already understands that is displaying errors publicly. Using `WP_DEBUG`isn’t an option here, I think, if anything, this is such a big feature that it warrants its own constant if that were the route to go (it does feel simpler than needing to create a whole drop-in file). The reason the debug constant is bad for this is how many sites just enable various ones because plugin X said to do so, there’s a surprising amount of sites out there that have it enabled. Thanks for WP_DISABLE_FATAL_ERROR_HANDLER! The WSOD protection definitely slows localhost development down, so I was very happy to see that one can disable it on a dev environment. Thanks so much for this, Felix! Really excited about the feature. Is there a hook/other way to change the text on the button so that folks can be linked to upgrade automatically/directly? If not, would it be possible to add one? Is it possible/could it be possible to provide different PHP version requirements for the widget to help get folks upgraded sooner (with appropriate wording around “recommended PHP upgrade”)? Would it make sense to change from `WP_UPDATE_PHP_URL` and `wp_update_php_url` to `WP_PHP_UPDATE_URL` and `wp_php_update_url` to make it clear they aren’t related to WordPress updates? Hey, is there any error reporting about blocked themes? I can see a theme with fatal error is listed under “Blocked”. But I can’t see any error reporting about this. I read somewhere that wordpress is going ‘warn’ for outdated php versions. I do hope you take into account distributions that back patch. Otherwise I have to explain again to clients how !#$! @#$ these developers are, that do not know such simple things of system administration. He? That is why you have different positions function descriptions for such jobs, do you get it???? Thank you Felix. I’m probably not the only developer that thinks only showing the notice on any version pre-5.6 is a bit soft, but it’s infinitely better than what we currently have! What is the recommended/supported way to disable completely the PHP version nag? We already have plans to get internal customers moved to our PHP 7.x environment over the next eighteen months, before PHP 5.3 goes out of support with Red Hat, and don’t want to alarm unnecessarily our content partners. Does this mean that you would not be upgrading your WordPress version to 5.2 and above for the next eighteen months? Asking this because WP v5.2 requires PHP 5.6.20 and above to function. Though I support helping the community update sites to the latest PHP, I have issue with “enforcing” implements that prevent the user from installing her desired plugin. Unless the user can reasonably nullify this feature it violates open source principles and the ethics of GNU public license. Richard Stallman uses the phrase “digital handcuffs” to describe Digital Restrictions Management programs of the virtual jail cells such as Apple and Microsoft. Furthermore, for both of these potential issues, WordPress will now enforce these requirements, disabling the button to install such plugins. This isn’t a soft limit, it’s a hard limit. If a plugin indicates that it _requires_ a certain version of PHP in order to work, then this simply restricts the user from even installing the plugin since it won’t _work_ on their install anyways. The end user still sees the plugin, and the end user still sees _why_ it’s not installable. User’s can still install these plugins if they want via ftp. I fail to see how this violates open source principles. If plugins don’t have any minimum version php requirements they do not have to include that in their description and there will be no restrictions applied. Unless the user can reasonably nullify this feature it violates open source principles and the ethics of GNU public license. I give it about 10 minutes from the time the code hits before there’s a plugin that overrides it and allows you to install anyway. However. This is not at all like the digital jail to which Stallman referred. This is literally a DEVELOPER saying “Hi, my plugin won’t work on your setup, don’t use it, it’ll break.” That’s something they can do already (writing a PHP check on activation) and we even encourage that action. Preventing people from breaking when we know it’ll happen is also a responsibility. I understand the sentiment behind this PHP health feature and I appreciate the work done to build it. My natural inclination is sceptic toward “restrictions” and “enforcements” in the land of open source. Therefore, so long as the user can reasonably excercize control over the feature—i.e. install the plugin regardless via FTP—then I stand corrected, and open source principles were not violated. So here’s how it works: A plugin hosted on WordPress.org that says “I only work on PHP 7” will not be able to be installed via the GUI of WordPress. There’s no impact to plugins that don’t list a required PHP version, there’s no impact to plugins hosted else where, and there’s no change to installing plugins via FTP. I imagine you could even use `–force` to install plugins like this via WP-CLI. Users will be told why the plugin can’t be installed and be linked to https://wordpress.org/support/update-php/ to explain how to get it updated. They will be guided as much as possible, given the broad use of WordPress, to an achievable solution. We’re not abandoning anyone here 🙂 And we sure aren’t locking them in. This is really awesome, WordPress keeps on improving.. really liking the new editor and overall version. Thank you for updating a new wordPress version . I think this feature of “health mecanism” is the beginning of something really interesting. In fact we can imagine than this feature can detect what plugin or theme affect site performance and offer advice and alternative solutions. Cause today WordPress have many plugin, which makes of this CMS THE ultimate CMS in the world. But but let’s be sincere, The accumulation of plugins can be very expensive for site performance.